Relief as Kiwi Call Count Yields Good News for Mangatete Kiwi! You are here: Home / Kiwi Coast News / Relief as Kiwi Call Count Yields Good News for Mangatete Kiwi! All over Northland, keen kiwi listeners have been braving the cold nights over the last few wintery weeks to record kiwi calls in their project area as part of the Annual Kiwi Call Count Survey. Article by Lesley Baigent, from Mangatete Landcare just south of Kaitaia. We always begin kiwi call count monitoring with a degree of trepidation, especially this year. It has been a great season for pigs and many a sheepish looking hunter has been seen slowly trolling the road in their utes with dog boxes on the back. They either ignore you and pretend to just be a cautious driver or they give an embarrassed wave and smile. But we know. The first night of kiwi call counting we always wait hoping none of our “regular” birds have met a rogue pig dog, new neighbour’s dog or any other untimely end. There are many tales of woe where call counts crash over a year or two as the result of dogs or ferrets. Forty calls to zero in the space of a year was the latest at one long term monitoring site. Please not us…. And then, as the last rays of light slowly disappear, the moreporks start to advertise. ‘Whirlpool’. Silence. And then a male kiwi. Relief! But only one. And then another. And another. How awesome is this. Every Kiwi should get to do this! 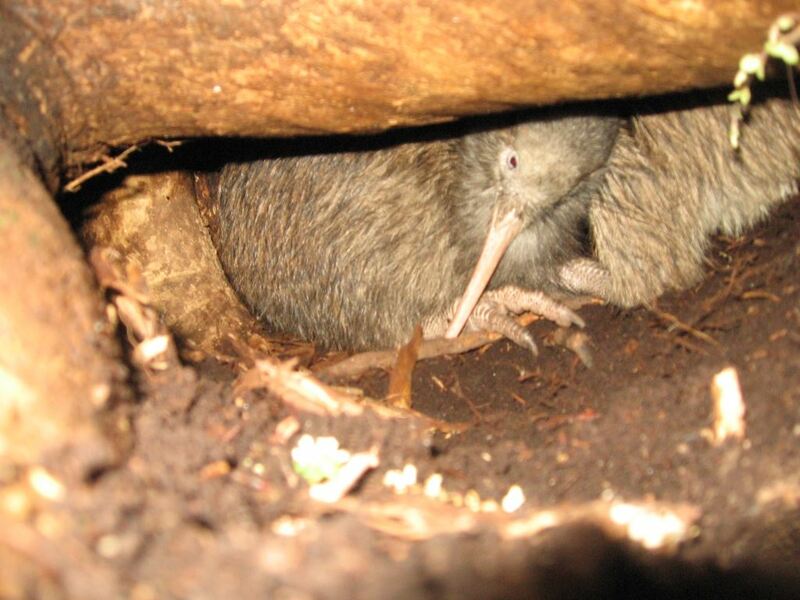 Excitingly, a pair of kiwi were spotted in a shallow burrow on one of the local properties within the Mangatete Landcare pest control area and the photo shared around the group, further boosting spirits and motivating everyone to go another round with the trapping and keep dogs well controlled. Phew. We made it through another year with all our regulars still alive. Twenty eight calls in the first hour and the kiwi sighting allows the worry to ease. Now we can just soak up the night sounds, stay warm and hope for a successful breeding season. Many of the projects linked in to Kiwi Coast are on the look-out for more keen eared listeners to help with the Annual Kiwi Call Count Survey. If you think you have what it takes, contact Ngaire the Kiwi Coast Coordinator and we’ll put you in touch with the closest group to you in need of help.